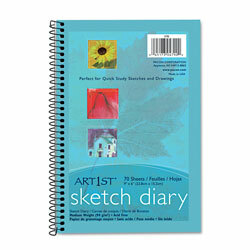 Sketch diary contains 70 sheets of medium-weight, sulphite drawing paper that is ideal all dry media. Each all-purpose white sheet is acid-free with 94 gsm. Spiral binding on the side works well for portable sketching. Diary is perfect for quick-study sketches and drawings. White Ruled, Perforated and Wirebound Writing Pads from Pacon! 841 In Stock today.